Above, reel life becomes real life! 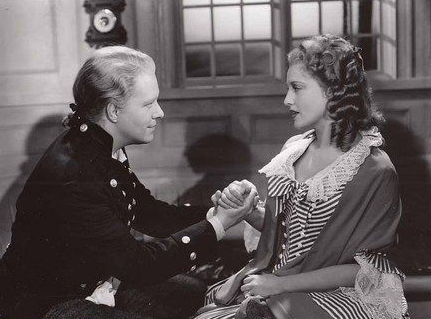 Nelson Eddy and Jeanette MacDonald in the most famous scene from their 1940 MGM hit, New Moon… the “Wanting You” number. 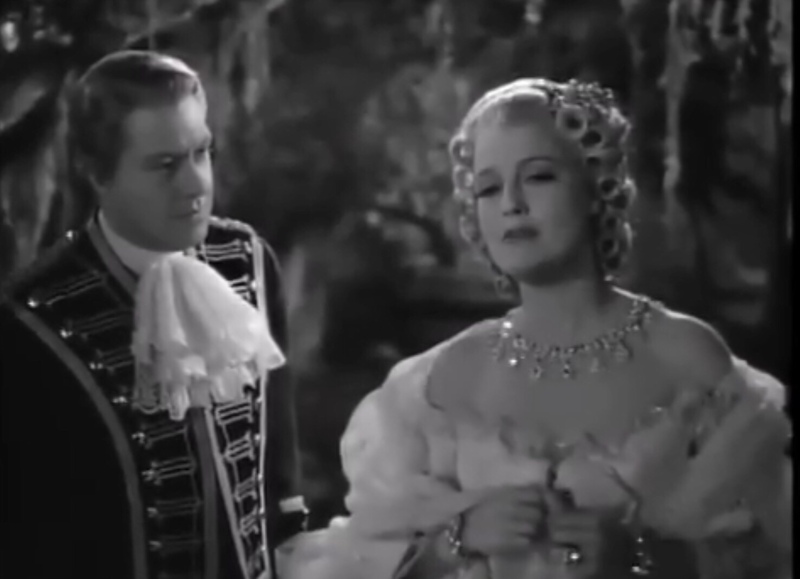 New Moon was the sixth Jeanette MacDonald and Nelson Eddy film and first made together after Nelson’s marriage in January 1939 to Ann Franklin. 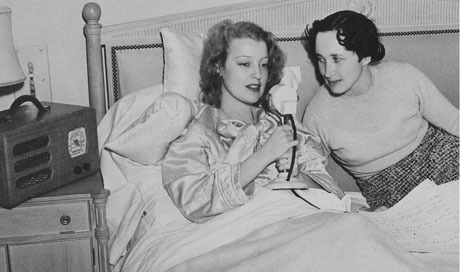 Below, Jeanette recovering from her suicide attempt after Nelson’s marriage… or as studio spun it, recovering from a bad cold. 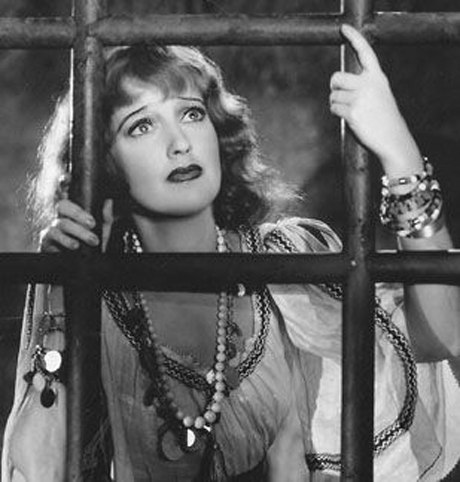 (Thank you, Woody Van Dyke II for your quick thinking that saved her life.) 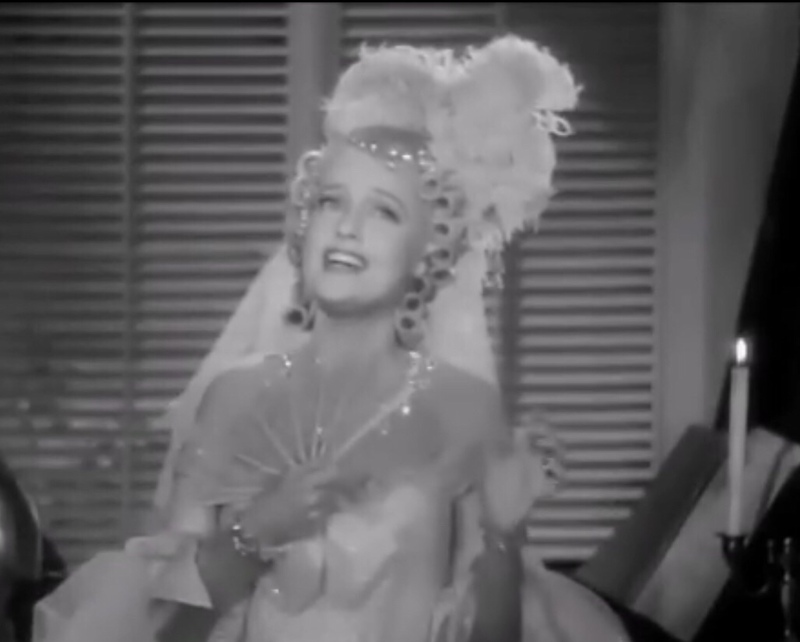 With little time to recover emotionally from the shock of Nelson’s elopement, Jeanette headed out on her first American concert tour where the love of her fans filled the void in her heart, reaffirming both her star value and self-worth as a person. Returning to LA, she finally began tough, demanding negotiations for a new MGM contract, figuring she had nothing to lose. 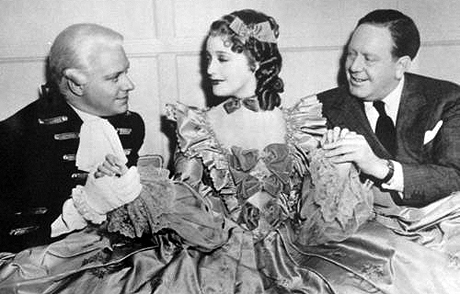 Nothing to lose, that is, except her self-control when inevitably her next film was with Nelson. Intimate scenes like the one below would have to be shot with the finger stroking, the searing gazes, his wandering hands and involuntary lack of control which in this film is safely hidden from view thanks to the loose jacket flaps. Plus the fact that in several scenes he just holds her close, either face-to-face or with her backed in to him and held closely. What woman wouldn’t melt over those words, even one who was so distraught at the implications and morality issues facing them since it was unlikely that the studio would allow them both to divorce their spouses. What happened next was a slow, deliberate wooing process. 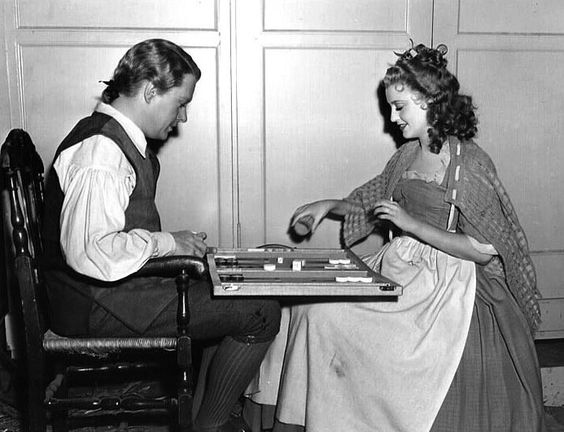 Literally being able to be able to sit across from each other and have a normal drama-free interaction like playing backgammon was a big deal at this point in time. 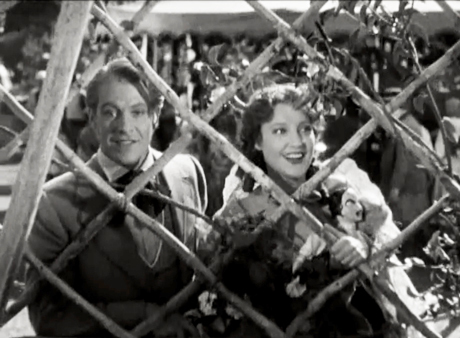 Folks say Jeanette and Nelson made love with their singing on-screen. Well, they did that in real life too. They would sing songs on the radio or in concerts that had special private meanings to them. In this case, it was a peeling away of the barriers and pain and re-establishing their own special brand of foreplay. So…Nelson got right to work. On October 22, 1939, he took over hosting duties for absent Don Ameche on The Chase & Sanborn Hour. 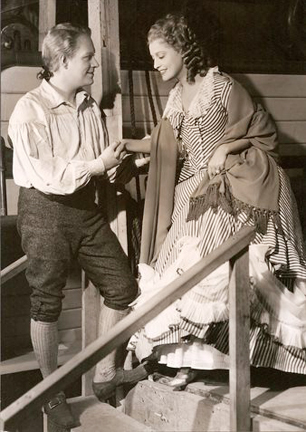 He sang more numbers than usual, following “Tramp, Tramp, Tramp” with “Londonderry Air.” Why this song? Because alternate lyrics with the same melody is the song “Danny Boy” … a tribute to Jeanette and Nelson’s lost son, baby Daniel Kendrick. 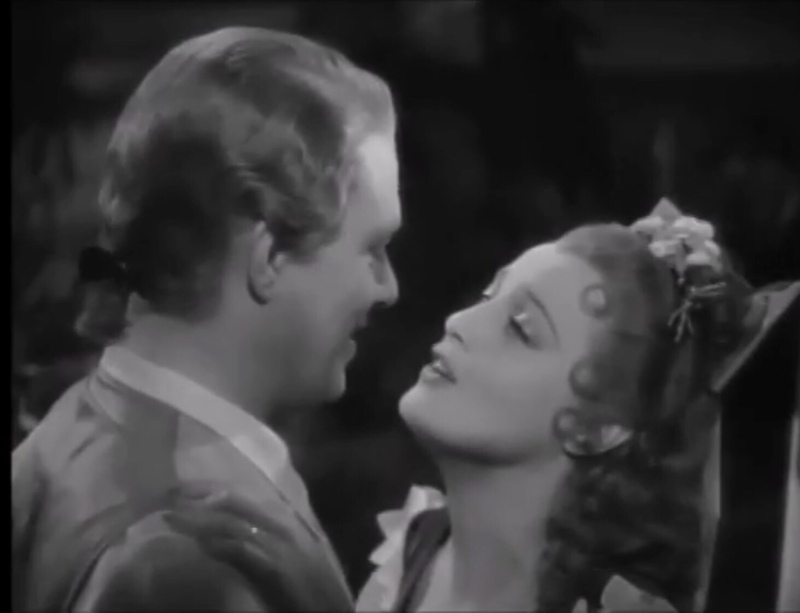 Additionally, Nelson sang a different version calling it a “romantic love song” with special lyrics by Helen Vordemann Knox, re-titled “My Love of Londonderry.” Even the repeated mention of May (ie, Maytime) in the lyrics would have special meaning for both Nelson and Jeanette. The song starts about 4:40 minutes into the show and he sings it with heightened emotion and the tempo drawn out a bit. We have observed this pattern with him over the years when overly excited, lovesick or terribly upset with something happening in their lives. ‘Twas in the merry, merry month of May. ‘Twas there I found my own, my blue-eyed darling. In one short hour she stole my heart away. “Will you be mine?”, I asked her, gently pleading. But in that glance, I saw the love that never dies. The birds were singing blithe and gay. And wooed and won her heart to be my own always. By the way, Nelson is in excellent, robust voice on this show and has an energetic, almost excited enthusiasm throughout the show. 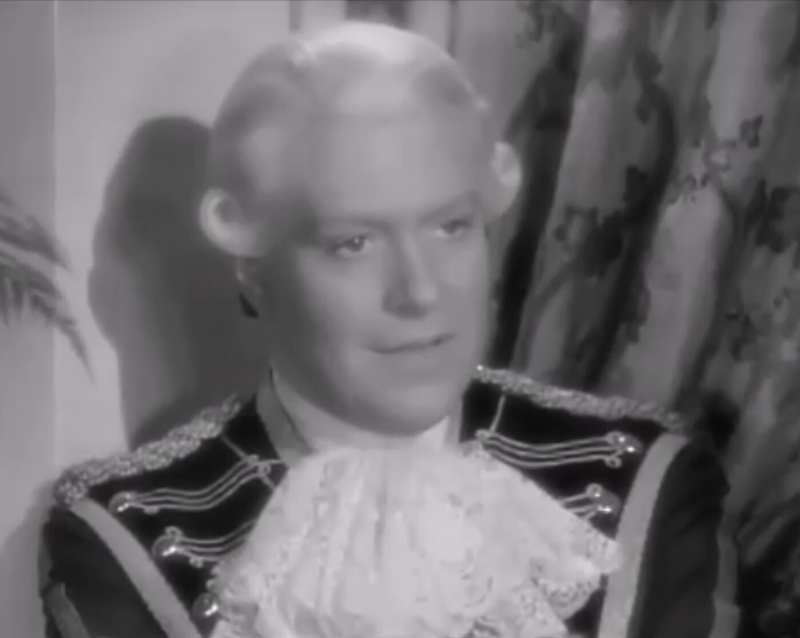 For the finale of the program, about 53 minutes into it, Nelson gives a final punch by describing how Victor Herbert “translates romance into music” and then says he’s combined a medley of “Sweethearts” and “For Every Lover Must Meet His Fate” – “which I hope will prove my point.” Just in case Jeanette hadn’t gotten his message loud and clear. 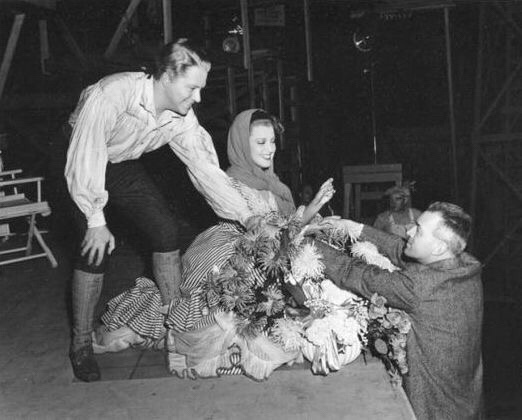 The very next day, October 23, 1939, Jeanette answered his “love call.” She pre-recorded “One Kiss” at MGM for “New Moon” and one week later she sang it again on the radio; see Katie’s blog post here to listen that show. Basically, it was an unnecessary number to sing at that time since the filming hadn’t even begun so there was no movie to promote! 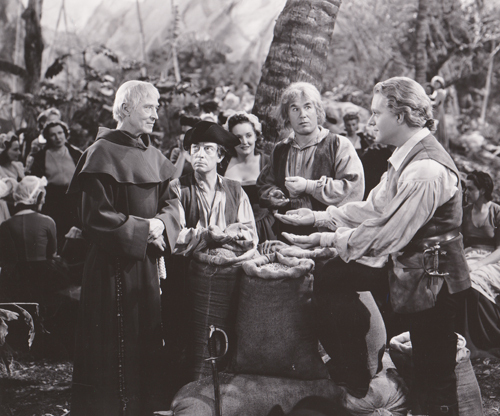 Actual shooting began shortly after with Woody Van Dyke directing. 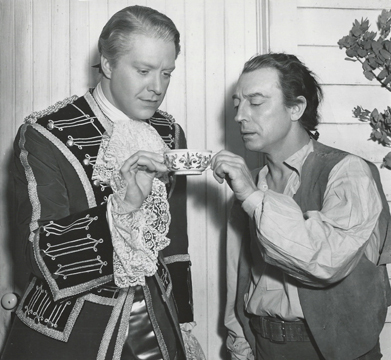 The original cast included Buster Keaton as one of Nelson’s “stouthearted men.” The two goofed around on the set…but Keaton was later cut from the film once a new director took over, reasons unknown. Here’s an outtake scene, one of the few left with Buster Keaton still in the film. 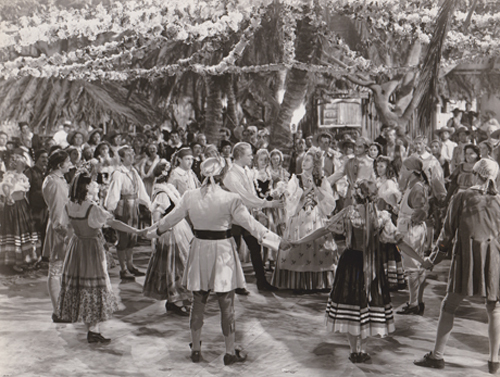 And another outtake scene with Nelson and Jeanette and the gang, singing the Rondelet number (Dance Your Cares Away). The scene was severely edited but you can hear the original recorded full number at the link below and it sounds like Buster Keaton is part of this recording. 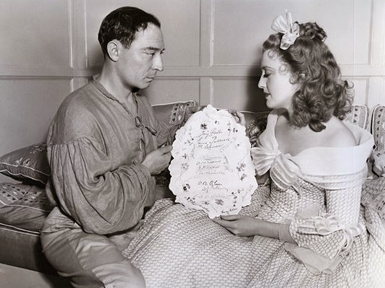 Jeanette had her somber, reflective moments on set early on, pictured here with Buster Keaton. 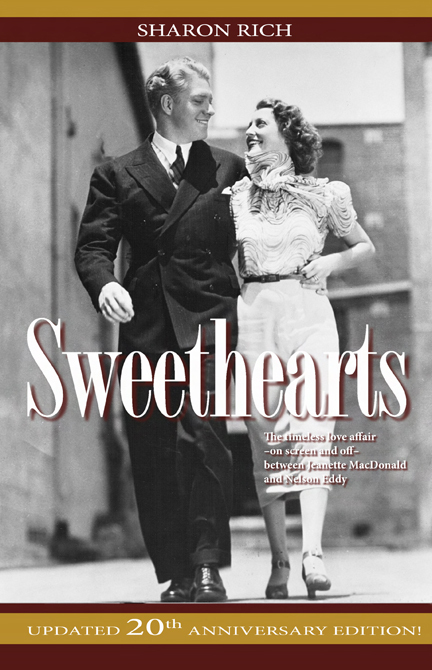 As noted in Sweethearts, her vocal stand-in commented that Jeanette fatigued easily, had trouble remembering her lyrics and would only rehearse and record alone, not with Nelson. Director Woody Van Dyke was called away for Marine duty and Robert Z. Leonard took over. Even though he’s in this picture, he’s the forgotten man for the moment. Nelson and Jeanette are in their own universe…a fact that was commented on by so many people interviewed…and observable of photos of them with others around. In particular, Nelson’s focus is usually totally and only on her. 17:00 Woody directed this scene as we have candid photos showing their laughter while filming. 42:00 The most outstanding scene of “New Moon” is the sexually charged “Wanting You” number. I worked on many sets but very few where the actors could emotionally move the crew the way these two did. It was chilling and exciting. And then came the clinch. I don’t think they realized what was going on. Finally Jeanette pushed him away, crying, and ran off. Nelson looked dazed and went after her. The next day they walked in together, arm in arm, with smiles you couldn’t kill. You can read an article of what to watch for in the “Wanting You” number at this link. 1:40. 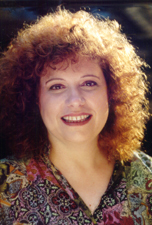 Robert Z. Leonard must have loved filming Jeanette’s expressive eyes. 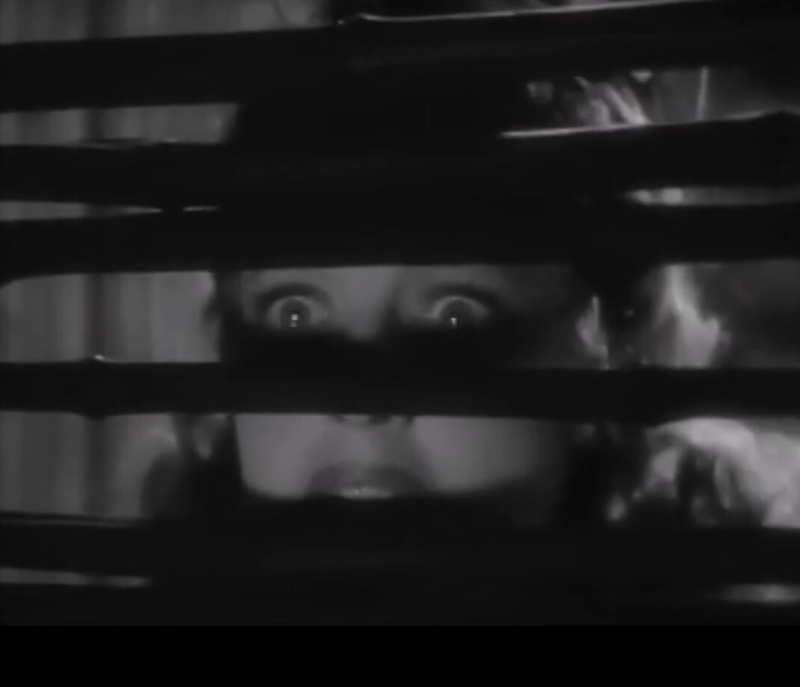 Here’s a closeup of her peering through the door slats while a war is happening in the distance. 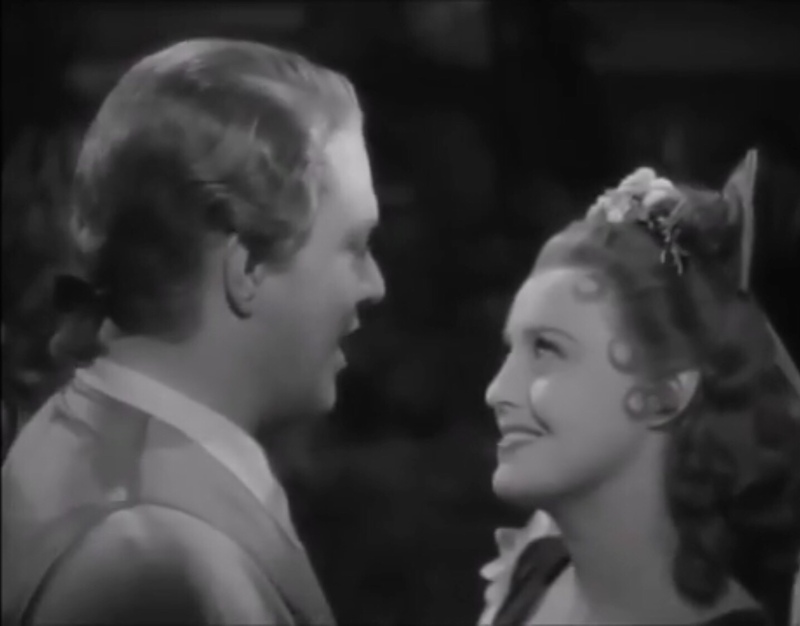 And even the same in Maytime, Leonard framed her face (and Nelson’s) which means he captured a very similar stylized shot of Jeanette in all three of the Mac/Eddy films he directed. 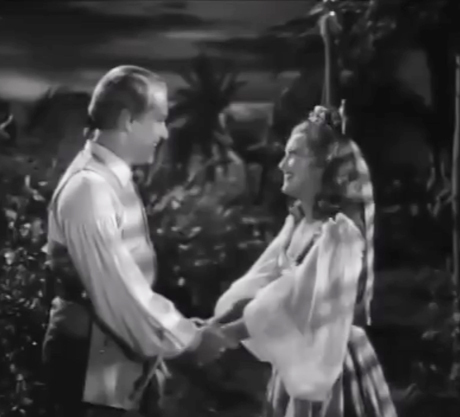 1:42 On this finale scene, we see a quick glimpse of Nelson’s boyish grinning at Jeanette as he tightly grips her wrists while the camera pulls back and focuses attention on his stouthearted men marching off into the wilderness…or somewhere! © 2018 by Sharon Rich, all rights reserved. The above quotes and book passages are from Sweethearts (© 1994, 2001, 2014 by Sharon Rich) also available at Amazon as a Kindle or softcover.